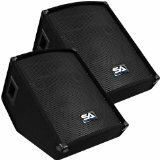 Pair of 12inchWedge Shaped Monitors with Titanium Horns - Model #: SA-12MT (Pair), 2-way 12inch Speaker, 200 Watts RMS; 400 Watts Peak, Woofer has 40 oz magnet and 2inch voice coil, 4inch x 10inch Horn, Titanium Compression Horn Driver, Two 1/4inch inputs and two Speak on inputs, Frequency Response: 45Hz to 20kHz, Impedance: 8 Ohms, Sensitivity: 96db, Dual ports, Full metal grill, Recessed Handles, Black carpeted covering, LxWxD: 23.5inchx14.75inchx14.75inch, Weight: 30 lbs per monitor, Condition: New, One Year Warranty. It's important that you can hear your music on stage. These wedge shaped, 12 inch monitors deliver every sound clearly with a 12 inch speaker, 4inchx 10inchTitanium Horn Driver, a frequency response of 45Hz to 20,000Hz, and 200 watts RMS, 400 watts peak power. Great quality monitors are very hard to find, especially at a decent price. The Seismic Audio brand was designed to make the professional musician, as well as the musician low on cash, sound great. With your purchase, you will receive two monitors pictured and described above.